Green Bay, Wis.-based Schneider reported operating income of $118.6 million and adjusted net income of $86.8 million, or 49 cents a share, in the three months ended Dec. 31, compared with operating income of $93.7 million and adjusted net income of $58.1 million, or 33 cents a share, in the same period a year ago. Revenue increased 11% to $1.32 billion in the fourth quarter of 2018 from $1.19 billion in 2017. CEO Chris Lofgren said the company saw gains in each of its business segments. “Our focus on sustainable contract pricing in our truckload segment, reallocation of capital expenditures to our intermodal segment, and leverage of new revenue management capabilities in our logistics segment produced revenue growth and strong operating results,” Lofgren said in a statement released Jan. 31. Breaking down results, the truckload and dedicated segment generated operating income of $77.7 million in the fourth quarter of 2018, an increase of 23% from $63.4 million in 2017. Revenue, excluding fuel surcharge, rose 2% to $583 million from $570.6 million. Revenue per truck per week was $3,985 in the fourth quarter of 2018, up 5% from $3,797 in 2017. The number of company-owned and owner-operator trucks in the truckload segment, however, fell to 11,575 from 12,005. Results were negatively affected by operating losses of $9.4 million in the First to Final-Mile business. Even with the losses, Schneider said its truckload operating ratio, which is the percentage of operating expenses to revenue, was 86.7 in the fourth quarter of 2018, compared with 88.9 in 2017. Intermodal generated operating income of $41.5 million in the fourth quarter of 2018, an 87% increase from $22.2 million in 2017. Revenue surged 31% to $272.5 million from $208.6 million. Logistics generated operating income of $17 million in the fourth quarter of 2018, a gain of 27% from $13.4 million in 2017. Gross revenue was $285.5 million, up 14% from $249.5 million. 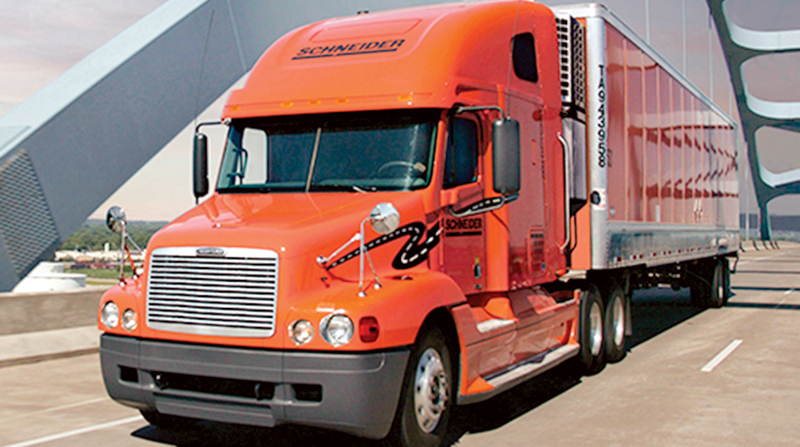 For the year, Schneider reported adjusted net income of $275.2 million, or $1.55 a share, on revenue of $4.98 billion in 2018, compared with net income of $161.2 million, or 94 cents a share, on revenue of $4.38 billion in 2017. Schneider ranks No. 7 on the Transport Topics Top 100 list of largest for-hire carriers in North America and No. 18 on the Transport Topics Top 50 list of largest logistics companies.